We’re all in it now! 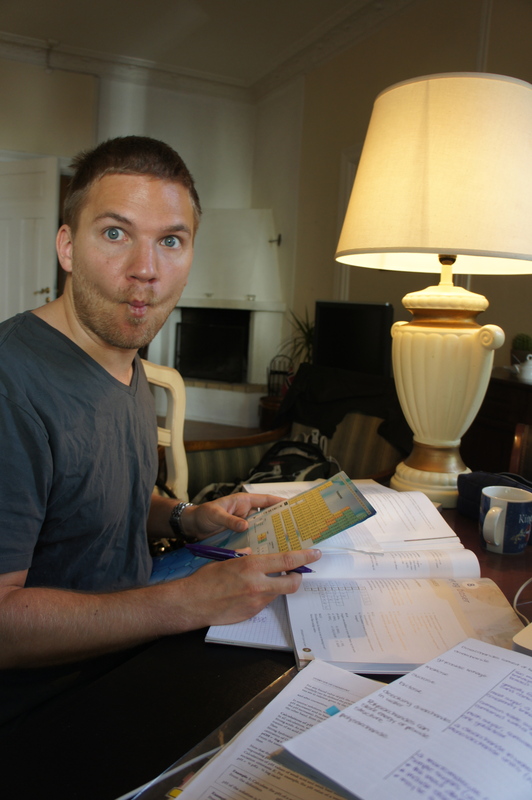 Christian has taken a two-week break from work so that he can cram for the exam. 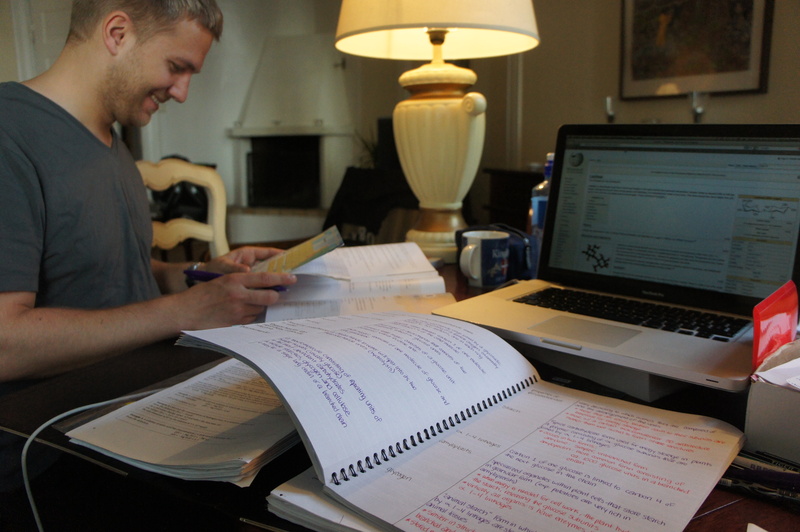 Skjalg is using the time to review for the upcoming year (lucky guy gets to do so without the stress of an upcoming exam). 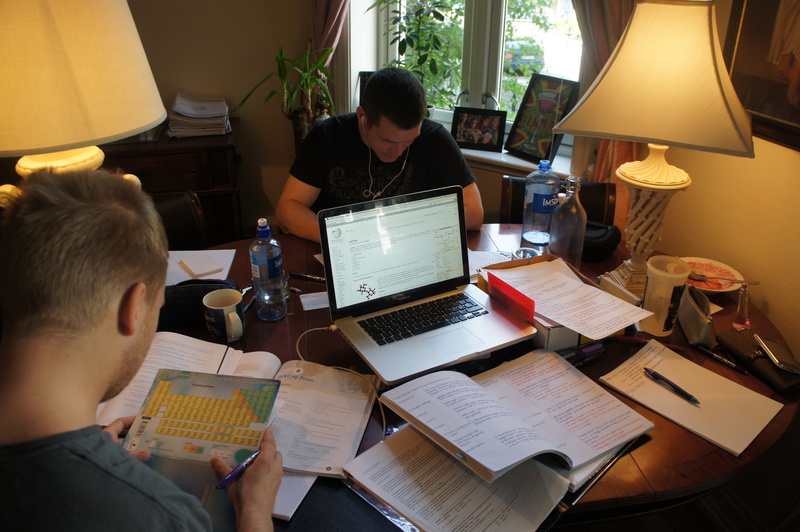 I really enjoy when we are all sitting together, purging info, and teaching each other our newfound knowledge. My current plan is to spend one day on each point provided on the check-list I found on Bjørknes Høyskole’s website. For those of you who didn’t see my Study Aids post, here is the file again: Guideline of Topics for the Entrance Exam 2012. Our study den. A little bit of a library feel going on. 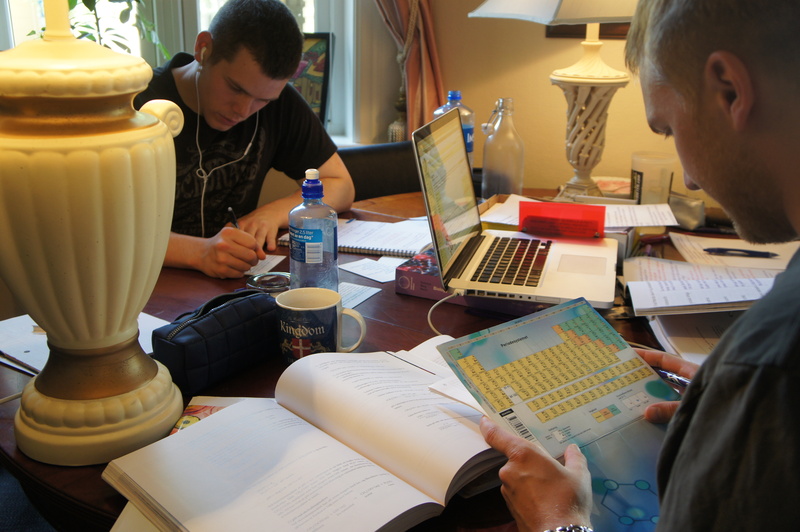 Can’t blame him for smiling – he *is* looking at the periodic table. I have discovered your blog a month ago, it’s really inspiring. Thanks for sharing so much helpful information. I applied to the Semmelweis University medical program and received the feedback that I have to do the entrance exam despite of having an MSc degree in science. I have seen the entrance exam topics. I would really appreciate if you could maybe share which human biology and chemistry books to use to study as I have not studied for long time and have to prepare beside work. In addition, which other medical university would you recommend to apply to in Hungary: Szeged, Pecs or Debrecen. Many thanks for your response in advance! Thank you so much for your message. I’m sorry to hear that they are requiring you to do the entrance exam despite your qualifications. In the “resources galore” section, I’ve included some preparation manuals that should help for the exam. It had been a few years since I was in school when I had to prepare for the entrance exam and I found the videos at Khan Academy to be the most helpful. I looked through the topic list and then watched all the videos that felt relevant to those topics. Taking notes and drawing out all the diagrams really, really helped me get back in the groove. If you learn well from videos, I really recommend those. I don’t really know anything about Debrecen, unfortunately, as it wasn’t included in the list of schools we could apply to when applying through Norway. Szeged was originally our first choice, but we dropped it when we learned that it isn’t on California’s list of accredited universities. Pécs is similar to Semmwelweis, but it is in a very small town. There are a few students who have now transferred into Semmelweis after doing the first two years in Pécs. Some liked that the city was really small and felt that it added to the experience, whereas others were happy to get out of there. Many thanks for your detailed response. I watched some of the videos at Khan Academy, they are really good and easy to learn from. I also downloaded the biology and chemistry overview from your Resources Galore. Do you think the combination of these will be sufficient for the exam or do I need to study something else? I also ordered some books which were recommended by the teachers on studyhungary. I have basically 2.5 months to prepare beside work, not sure if it’s enough. I just checked the accredited universities by California and all 4 universities are accepted from Hungary including Szeged too. Do you have a private email address and would you be so kind to answer some of my questions there? No problem at all! Yes, I think those should be enough. The textbook may help with the understanding, but the overviews should contain enough of the details you’ll need to know. I think 2.5 months will be fine! That’s great that they are now all accepted 🙂 I don’t really know anything about what it is like to study at Szeged, other than that it is beautiful down there. Feel free to email me at biancamirella@gmail.com. You are currently reading Studying, Studying, Studying at Buda-B.